The State in Which Art is inevitable.
. the object is not to create art, but to be in the state in which art is inevitable . Here is a blurb I wrote as a contribution to a magazine. When we achieve balance within our body, mind and spirit we naturally take in a broader spectrum of information. Our higher self will not open the psychic floodgates unless we’ve shown we can handle the stresses our daily lives. How can we take in the complexities of spiritual information when we cannot handle the mundane? Our intuition, though considered spiritual by nature, is directly related to the physical world. Food we eat, and the amount of exercise we get, is directly linked to the development of our intuition. We can either create a balanced body that is a clear channel for information or we can struggle through pulling psychic information through a toxic body. The truth is our bodies are highly functional pieces of machinery with the ability to take on much more than we think. We are equipped with physical glands that are the gateways to higher dimensional realities. These tiny glands regulate the amount of psychic information we receive, and represent the physical connection between our world and beyond the veil. The Pineal and Pituitary are the most famous of these psychic organs and once we understand how they function we gain deeper insight. The Pineal gland is also known as “the third eye” as it looks and functions like an eye, only perceiving a spectrum of frequency beyond the physical. It is responsible for clairvoyance, visions and balancing the pituitary. The pineal produces melatonin and is the balancing point for the sacred rhythms in the body such as: the circadian rhythm, the female menstrual cycle and the subtle cycles of the emotions, mind and spirit. The Pineal gland is the physical balance point of these sacred rhythms in our body, and when balanced it allows us to establish a solid platform for psychic expansion. Even though the pineal gland is located deep in the brain, sunshine is extremely nourishing for it, in fact, 30 minutes per day will provide you with a healthy amount of stimulation. Darkness also has a activating effect on the pineal, in ancient Egyptian mystery schools students would be placed in pitch-black darkness, as it was believed that the pineal will take over and begin “seeing” what your physical eyes cannot. When it comes to the foods we consume, they can either encourage the activity of the pineal or discourage it. Refined sugars and grains, preservatives, heavy metals and fluoride in our water slow the processing of the pineal. Fresh oats, tomatoes, rice, pumpkin seeds, watermelon seeds, and almonds all contain melatonin, which in turn supports the pineal. 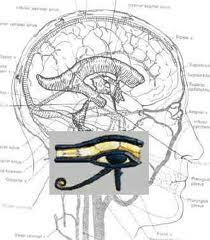 Psychically, the pituitary gland works in tandem with the pineal. In ancient mysticism the pituitary is the masculine and the pineal is the feminine in the “sacred marriage.” The two of them together create the foundation of multidimensional sight. The activation of the pituitary is directly connected with the activation of the pineal; working with one will stimulate the other. To help the pituitary thrive you may wish to up your intake of potassium, calcium and iodine rich foods. The Chinese medicine men also believed that ginger tea was a stimulant for the pituitary gland. Lastly, humming and reciting mantras while bringing conscious attention to your psychic glands will create an energetic and sonic reverberation that is also stimulating to them. Ultimately in order to begin taking on higher frequency, or “psychic” information we need to clear the channel in which it flows through. Our body is not unlike the lens of a camera or pair of glasses, the dirtier the lens the more distorted the information becomes. When we become conscious of how our physical world affects the non-physical we can begin expanding our intuitive prowess. Becoming conscious of the health of our psychic glands dramatically increases our intuition as they are directly linked to higher dimensions of reality.